The idea for the Island Welcome exhibition for Radiant Pavilion 2017 arose after a family holiday in Fiji in 2016. We had travelled to visit Australian friends working there and to experience this near-neighbouring set of islands of the Pacific. Our arrival as tourists was one of generous and joyous welcome. A singing and ukulele greeting before we even reached the passport check point. In visits to villages and islands we were welcomed, sung to and bedecked in both plant/flower welcome lei and shell neckpieces. I was struck by the open heartedness, the sense of acknowledgement and ceremony to the moment of arrival. What was beautiful in these fresh lei was the making process the preparation by the villagers, the gesture of welcome at arrival the ephemeral nature of tropical flowers and plants and the continuity in the practice of making fresh lei for each new arrival. 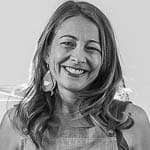 Returning to Australia, to the often-brusque border security welcome even as an Australian returning from travel, I felt that this concept of welcome in our country required some more thought. Earlier in the year I had enjoyed the Lei in Contemporary Pacific Cultural Practice exhibition in the NGV, the scale of the pieces and materials and concepts of place and identity from many Island nations expressed in garlands. 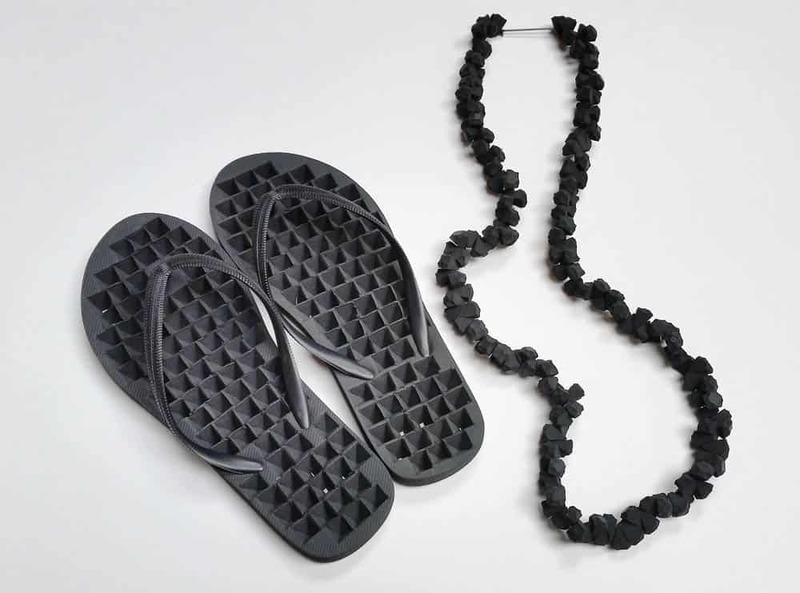 Curating Island Welcome, engaging eight Australian jewellers, to respond to the concept of how Australia welcomes refugees, has been an immense privilege. 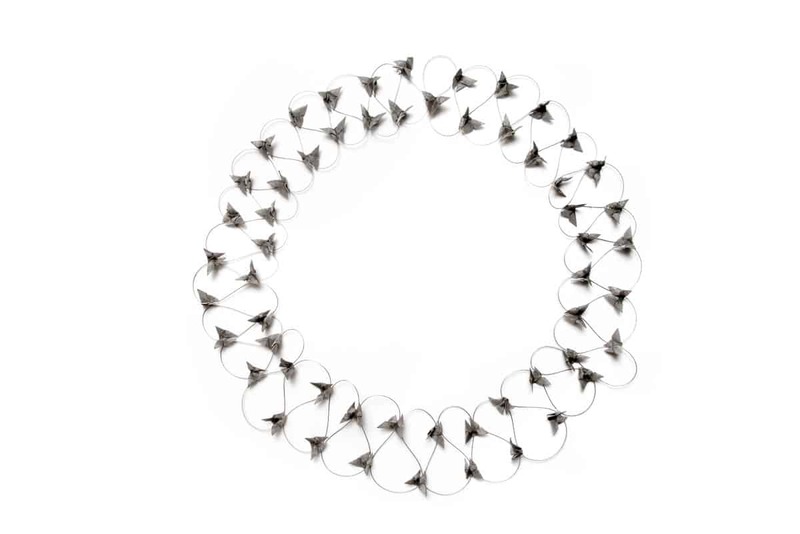 Each artist has considered this most complex of current political issues, and responded with a single neckpiece. May these eight considered neckpieces speak for themselves as we all reflect on this refugee crisis of our time and our duty to acknowledge strangers. Leftovers is informed by the origin and meaning of the lei in Polynesia, and the way locals use it to welcome foreigners in their countries. In Australia, our multicultural diversity suggests that we are a welcoming place; whilst this may be true for many, others in search of a better future on our shores continue to experience the hardship of “fitting in”. My “welcome to island” neckpiece is a representation of these differences. On the one hand, the chain references isolation and confinement. On the other hand, by using remnants of chains collected all over the world and linking each section to the next, my work reveals that there is scope for bringing unity out of people’s differences. 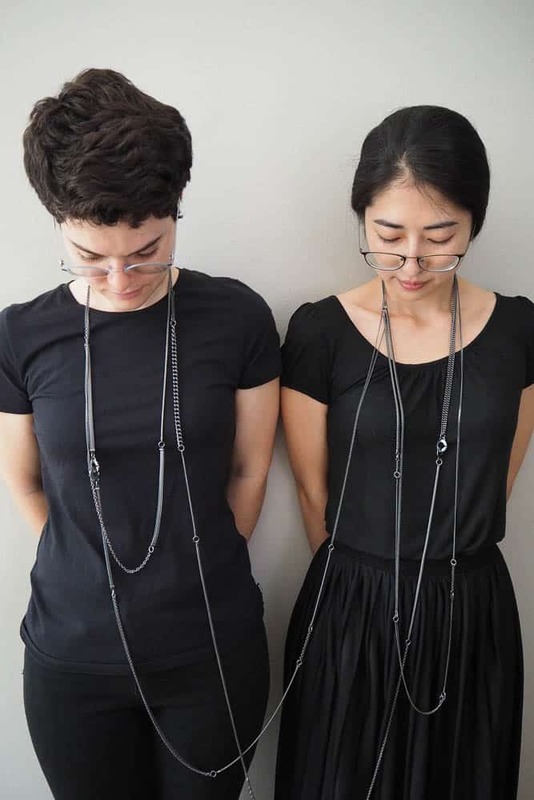 Leftovers can be turned into two neckpieces, enabling the wearer to pass on part of their chain to someone else as a welcome gesture, a piece to be shared. 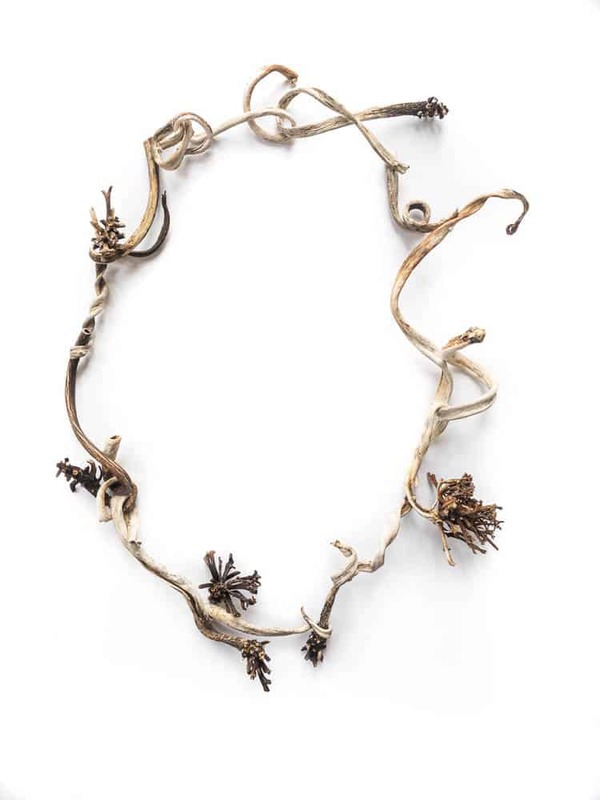 Historic and present-day ceremonies, rituals and superstitions connected to jewellery as signifier inform my work. 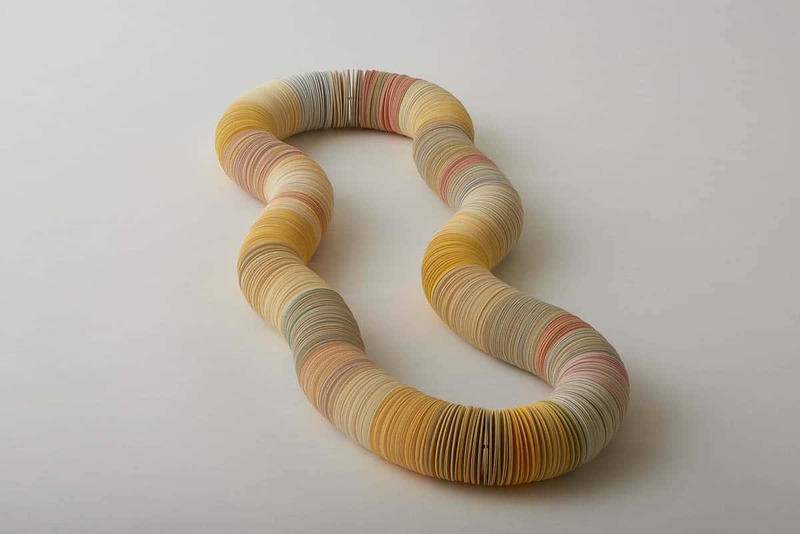 For this neckpiece, titled Welcome, I employ the repetitive and time-consuming process of embossing and threading hundreds of paper discs. 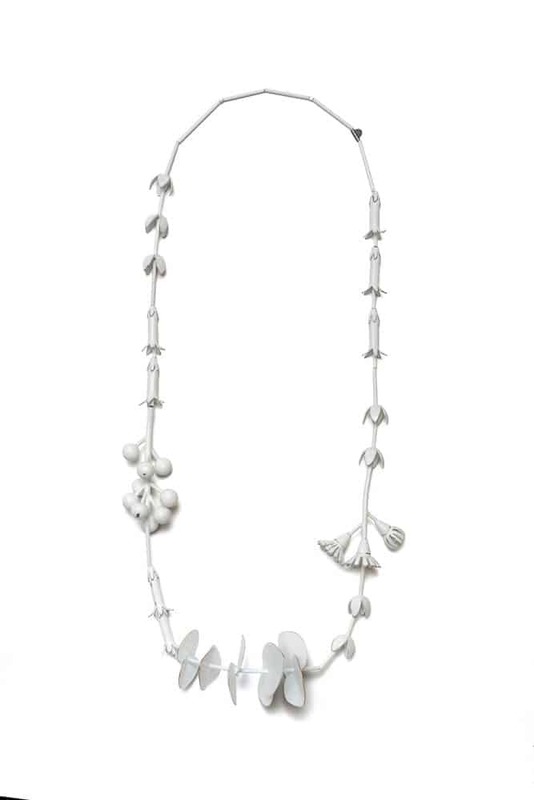 The form and technique of this neckpiece references the traditional garlands found across many cultures, given to an individual as a symbol of welcome. I offer this neckpiece, not to an individual but collectively to the idea of expanding acceptance and a deeper understanding in us all. My experience with garlands has always been incredibly positive, joyful and humbling. In 2014 I did an Asialink residency in Bangkok, Thailand researching the traditional craft of Phuang Malai (Flower Garlands). When I was presented with a Phuang Malai I felt welcomed and honoured, I felt a part of a tradition. The flowers were picked and strung together in an intricate design just for me. I was moved by the gesture, the craft and the tradition. This garland is an idea, a concept, a notion, a gesture, an offering of welcome, acceptance and my wish for change. Composed of iconic Australian native plants like the Eucalypt, Flowering Gum, Wattle, Correa, Boronia, this garland’s materiality of heavy brass symbolising permanency, stability and solidarity. Whilst the colour white represents peace, innocence and hope. ‘Seaweed, things of sand and sea. It is the tree of the ocean. finding a place on our island shores. our land for all of us to share. Welcome, welcome to our island. And join with us in celebrating our island nation. In my hometown on Darwin, it is customary for everyone to remove shoes when entering a house. Often the welcome mat is circled, almost lei like, with an eclectic collection of footwear – the most frequent of course being the thong. While making this piece, I was also thinking about the old saying “to walk a mile in another’s shoes”. 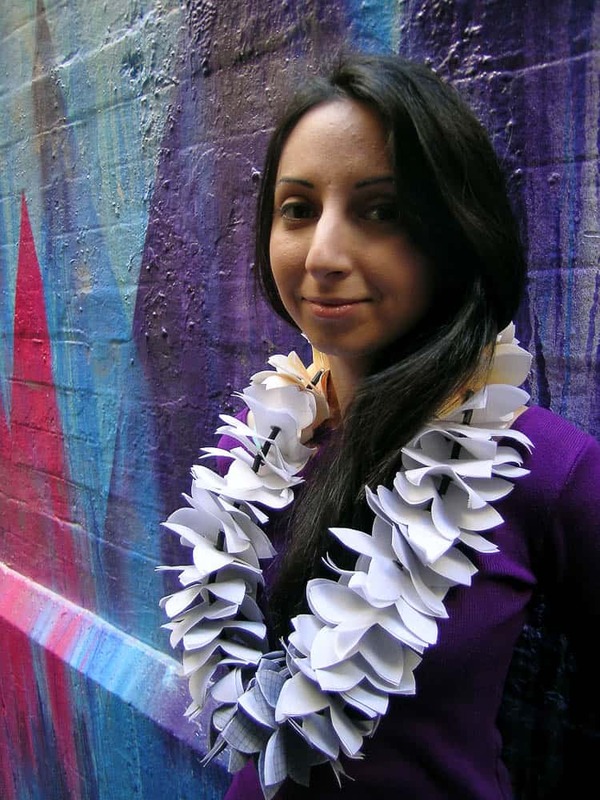 The thinking I have for this Lei is to welcome with empathy. In December 2016 I met a young Iranian refugee woman through the Melbourne Artists for Asylum Seekers group. Detained on Christmas Island for two years in the Immigration Detention Centre there, this garland is a tribute to her. Presented are two pictorial elements drawn from a heartrending conversation we had about her experience of arriving in Australia. Azizeh spoke about the chance she had one day to climb a frangipani tree that she had fallen in love with that was growing outside the detention centre. Through it she felt something of the warmth and beauty of Australia. The frangipani flower symbolises this while also referencing the Pacific island tradition of welcoming strangers through its use in leis and garlands. The grey chainlink fencing she was faced with for two years is its antithesis. She spoke of the land and her initial welcoming experiences in paradoxical terms, of being both welcomed and hurt at the same time. We have a duty to look after each other. Remember no one chooses to be a refugee. Let us honour our shared humanity. Island Welcome has been a journey of inquiry, deep sadness and yet also hope. Cyclical like a garland, I kept returning to the visual of being fenced in, protected from and protected by. Listening to many refugee voices repeated this language of caging in and restriction, of transitory space and always mention of metal wire. Researching sources of Razor Wire, I was presented with a language of separation, protection and defence with a right to inflict harm, tear clothing, all in order to keep safe. So I began with 56 barbs for every 10-metre length of wire. For my garland in place of metal barbs, origami butterflies as a symbol of freedom and transformation, the capacity to unfold and take new form in the world. Fifty-six butterflies folded in stainless steel mesh, some printed with the Articles 1. & 14. from the Universal Declaration of Human Rights, suspended on ten metres of wire. What if I become a refugee? Would I be welcomed by another country? There are currently 65 million refugees, asylum seekers and internally displaced people around the world. Prime Minister Turnbull says Australia will permanently boost its annual refugee intake to 18,750. However between 2014-2015, there were a total of 195,099 permanent migrants, of whom 3.2 percent were resettled refugees the lowest in 20 years. I appreciate this is a complex situation. However, I cannot accept 1400 refugees being detained on our shores, including Christmas Island, with an additional 1186 taken to Nauru and Papua New Guinea. The average time period for people detained on our shores being 443 days. Proud Aussies wear the flag on Australia Day as a symbol of their patriotism. I feel deeply uncomfortable with Australia’s migration history past and present, our flag and our national anthem. I wanted to transform the flag to look more like a net, not aggressively slashed, but unpredictable and full of holes representing the uncertainty of the process of coming to Australia as a refugee. Deconstructing the flag into this not-so-welcoming lei has been much more time consuming than expected. Whilst unpicking and beading I reflected on how lucky I am to live in such a beautiful country, and the inequality for people that are forced out of theirs.